Is learning acoustic guitar chords very difficult? Not really! Countless expert guitar players have made a fortune entertaining audiences in social events, shows, and concerts. You can strum through a tranquil night beside a pit fire or choose to shred it amid jam sessions with friends. Aside from that, playing the guitar ensures that you’re always on top of your game mentally. A guitar is a simple and helpful way to get lost in some cool and sweet music and unwind your mind after extended periods of working. Learning acoustic guitar chords will be more effective if you read learn guitar part-1 before reading this one. The good news is that you need not have a musical talent to play these exceptional musical instruments. You don’t have to be genius either; you just need time and commitment. But even as you set off into learning acoustic guitar chords to play this amazing piece of art, the absence of a proper guide can make it a frustrating experience. Many often give up. We have tried to compile the basic information necessary to learn playing guitar in this post. Now you know that you must not be a superstar to have tons of fun with this instrument. You just need to grasp a few skills and before you know it you’ll be rocking out. You need to learn some basic things before learning acoustic guitar chords. As guitar lovers, we all seek clean chords and notes with no irritating overtones. There is no fun in playing guitar that isn’t in tune since you don’t get the warm tones associated with a guitar. To avoid practicing on an out of tune guitar, you must tune the guitar regularly. This is also vital in familiarizing with the strings and the fret combinations that correspond with different notes. At first, let’s learn how to tune a guitar without a tuner or mobile app. Using an electric tuner is the easiest and most accurate way to tune a guitar. You only need to hold this to your guitar then pluck that high E. The guitar tuner will notify if is too high/sharp or too low/flat. You, therefore, get to easily pick every note then tighten the strings to make them drive higher or slacken them to make them lower. The room should be quiet while using the tuner so that microphone associated with the tuner does not pick up extra sounds. If you can’t get a tuner, you may still tune the guitar manually to match every note to those note corresponding it with the piano. Playing the guitar is not about picking up a guitar and start making your own music right away. Before you start, make sure you are holding the guitar correctly. Sitting up in a straight-backed stool or chair is the recommended position. The back of the guitar should be touching your stomach and chest as the following video demonstrates. If you are right-handed, play the guitar by strumming with your right hand halfway between the sound hole and the bridge while your left hand stabilizes the net and fretting the strings on the neck. You are free to move the left hand up and down the neck. As much as you may be holding the guitar the right way, your shoulder, neck, arms, and hands may hurt if you are new to playing and you get to play for a long while. This is normal and eventually, you will, in the long run, become used to it. Listening and playing music only become enjoyable once you start pulling apart the composition of the guitar and begin understanding the parts and what is going on. Having the knowledge of the names of the strings will be helpful in your future lessons, and assist you when you need to tune the guitar. Essentially, the tiniest string should be on the lower side while the thickest should be on the upper side. The following is an outline of the strings, the names, and numbers they are identified with. Chords are the building squares of music and it’s essential to know them back to front. 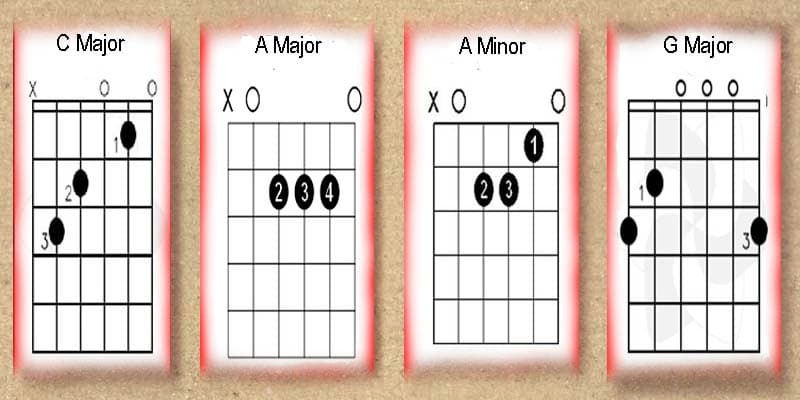 The five main chords are A – E – D – C – G. What is required of you for a start is to strum the guitar until you can hear a clear chord. After mastering the first single open chord, you can then go ahead and learn the second clear chord. After that, concentrate on practicing how you can transition between the two chords. You can achieve this chord by placing the ring finger over the 3rd fret of the 5th string. The middle finger should be on the 2nd fret of your 4th string, and your index finger to the 1st fret of the 2nd string. Go ahead and strum all the strings except the sixth string. Finally, return and strum every string independently, when continuing to play the chord. Each string should ring out noticeably. Place your index finger on the 2nd frets of the 2nd strings, the middle finger on the 2nd fret of the third strings and the ring finger over the 2nd fret of the 4th string of the guitar. 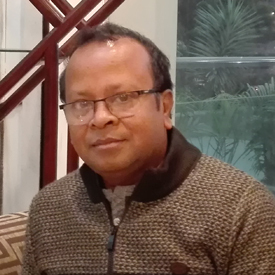 Put simply, it is a single line down the second, third and fourth strings. You play all the strings save for the top one. On the 2nd fret of the third string with your middle finger and the ring finger on the 2nd fret of the 4th thickest string, just place your index on the first fret of the 2nd thinnest string. A similar shape to the E major, but with one string moved down. The top string should be ignored. Position your middle finger on the third fret of the 6th string, your index finger should be on the 2nd fret of the 5th string. Ensure the ring finger is on the 3rd fret of the 1st string to produce this chord. Also, ensure each of the strings rings out quite clearly. It’s one of the simplest chords. You just need your middle finger and ring finger over the second fret of the fourth string and second fret of the fifth strings. The index finger is placed on the 1st fret of the 3rd string. It resembles the E major, although there is no need to use the index finger. You just place the middle finger on the 2nd fret of the second string and the ring finger on the 2nd fret of the third thickest string. Ensure the index finger is on the 2nd fret of the third string. Position your middle finger on the 2nd fret of the first string and your ring finger on the third fret of the second string. Ensure you play the bottom four strings only. 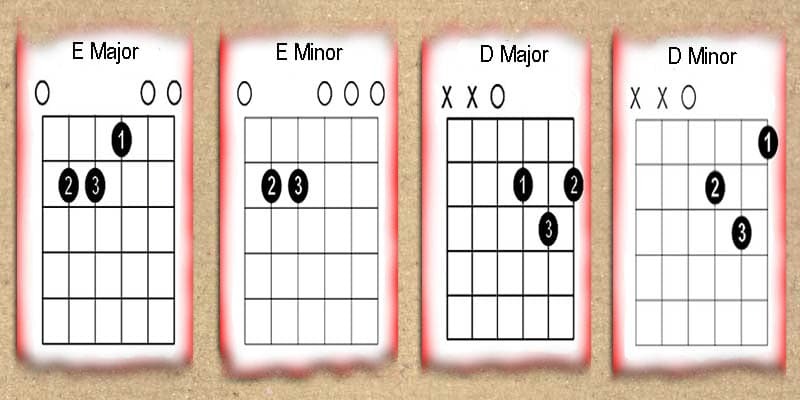 Yet again, D-minor is very similar to D-Major. It is required that you keep the middle finger on the 2nd fret of the 3rd thinnest string. Proceed your index finger to the 1st fret of the thinnest, and your ring finger to the 3rd fret of the 2nd thinnest string. Like the D Major, just play four strings of the bottom. We wrote this post with you in mind if you have thought about picking up the guitar but haven’t yet. Even if you are not a musician, becoming one is as easy as it is fun with an accomplished guitar in your possession. This might just be the right time to grab a guitar and get to revel in the very apex of entertainment. You will get to play a wide array of tunes and impress in many settings. With the guide above, learning acoustic guitar chords should be a walk in the park. Follow the simple steps and you’ll do just fine.